Related to carrying inward to a central organ or section; such as, nerves that conduct impulses from the periphery of the body to the brain or spinal cord: Afferent nerves are also known as sensory neurons which emerge from sensory organs and the skin to carry signals from those sensory organs of the body toward the brain and the spinal cord. 1. A description of someone who is wealthy, financially well off, or rich: In a truly affluent society, there's more than enough material goods offered for everyone to buy. 2. Prosperous, having sufficient financial means to live comfortably: Monroe was described as an affluent man who had plenty of money, property, and possessions to take care of his desires. 3. In an environmental context, to describe a small river or stream that is a tributary to a larger river: There is an affluent spring near Marita's home that will ultimately flow into the Mississippi River. 4. Etymology: from Latin affluentem, affluens, "flowing toward, abounding, rich, copious"; present participle of affluere, "to flow toward"; from ad-, "to" + fluere, "to flow". "It's Still Good to be Rich. Uncle Sam wants your money, and the crowd outside the gate wants your head. How to survive the populist revolt against affluence." May 11, 2009; page 66. 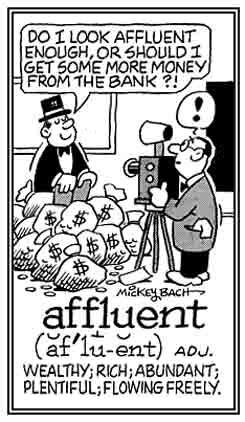 The metaphor of the tides that we find in the word abundance is also found in affluent. 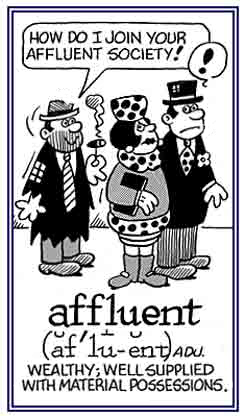 Latin affluere means "to flow to", from ad, "to", and fluere, "to flow". 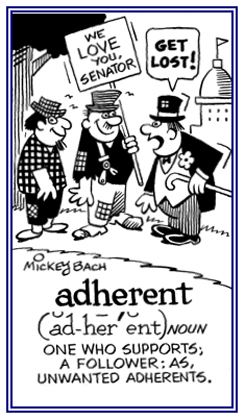 From its present participle, English borrowed affluent, originally in the literal meaning "to flow toward". Its meaning broadened to "flow freely" or "abundantly". Then a figurative use developed, "flowing with riches, wealthy". Springfield, Massachusetts, U.S.A; 1933; page 10.